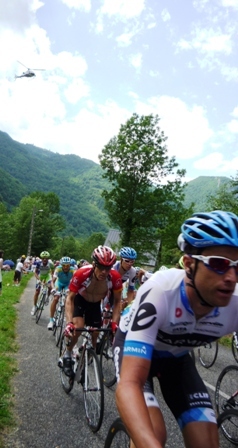 The Tour de France – Bon Appétit ! 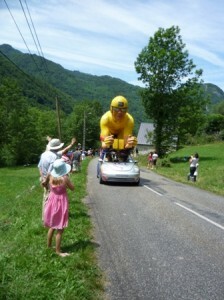 It’s Tour de France time here in the Pyrenees and, as usual, we went up into the mountains to cheer on the riders. What I love about the Tour de France is that it is really just one big picnic with a cycling race attached. 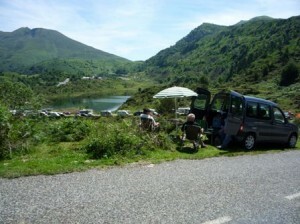 And the French certainly know how to picnic – no stale cheese and pickle rolls for them; even on the side of a mountain, out comes the table and chairs, the table cloth, the chilled bottle of wine and the three course meal. Moreover, on the way home, when we managed to get caught in a ‘bouchon’ of camper vans going nowhere, it wasn’t long before the driver and his passenger in the car in front decided that it was their supper time and, traffic jam or no traffic jam, they were ready to eat. So sure enough, they pulled over onto the verge and once again, out came the table, the chairs, the olives and hors d’oeuvre and they began their repas, seemingly oblivious of their audience in the stationery cars besides them looking on jealously. That was until more and more people decided that they had the right idea and started to join them. What in the UK would have been a fairly miserable or at the very least boring experience, here turned into a street party. This ability to turn every occasion into an excuse for a good sit-down meal and opportunity to set the world to rights just makes me admire the French even more and reminds me yet again what we are doing here.